As a department we are always looking for new and innovative ways of engaging with the ancient world (in fact, read Michael's interview about this!). Here are some of the activities we have run as part of our modules, often with the support of IATL, Warwick's Institute of Advanced Teaching and Learning. In 2018 Helen Ackers (funded by IATL) led a mummy painting workshop to better understand how portraits in Ancient Egypt were made. Read about the workshops here, and watch the video below! The Warwick International Higher Education Academy (WiHEA) supported a visit from Matthew Nicholls (University of Reading) to teach digital architectural modelling for all interested staff and students. We explored his digital model of ancient Rome, and learnt how to use software to create our own 3D digital models, which can be used for research and public engagement. We look forward to using our newly acquired skills in the years to come! Dr Emmanuela Bakola has been awarded a 'Pedagogic Intervention' Grant from IATL for her project “Ancient Greek Theatre in Action: Exploring the performance of Greek plays”. ovide in-depth, practical understanding of the material of the research-led lectures and seminars which will have been conducted in previous weeks. They will also foster imagination and original thinking coming from the non-traditional (for Classics) route of theatre practice. 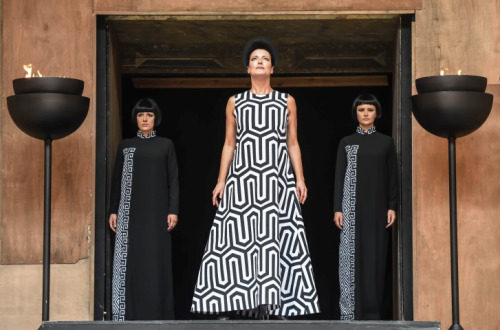 The grant also funds a session on the study of modern performances of Euripides’ Medea, led by the director of Archive of Performances of Greek and Roman Drama in Oxford, Professor Fiona Macintosh. This session will provide another dimension into the study of Greek drama, by introducing the students into a variety of acclaimed engagements with the Medea of Euripides and the value of archival research into the reception of Greek drama in performance. This year students in the Hellenistic world module learnt about the Text Encoding Initiative (TEI), a series of guidelines for creating and encoding online textual editions. Alex Peck and Clare Rowan worked alongside Robert O'Toole (academic technologist) to run seminars where students coded the archive of Hor (a series of demotic texts written in Ptolemaic Egypt) as part of a Higher Education Academy project awarded to Robert O'Toole. The result was a database of texts which can now be used by students as a resource for the remainder of the course. Digital storytelling ran again in 2016 in the Hellenistic world module - the winner of the 2016 'Hellie' is below. Enjoy! Dr Zahra Newby has been awarded an IATL grant for her project, 'Seeing, experiencing, doing: learning the methods of ancient art through performance and participation'. Building on the success of her IATL-funded mosaic workshop in February 2014, Zahra will incorporate into the teaching of her specialist module, Art and Architecture in Asia Minor a series of hands-on seminars and lectures focussing on the techniques used in ancient art including bronze casting and marble carving. For further details, visit the webpage. Dr. Clare Rowan has been awarded an IATL grant for the project Communicating the Classics via Digital Storytelling. As part of the second year core module The Hellenistic World, students were asked to consider the different ways in which we can interpret and present the ancient world through an interdisicplinary perspective, culminating in a trip to Oxford to compare the differing representations of artefacts in the Pitt Rivers Museum and in the Ashmolean. In the Spring Term students were trained in Digital Storytelling (via the company Netskills), which included seminars on What Makes a Good Story, Storyboarding, and training in the use of Vimeo, a video editing software. The students were asked to work in groups to develop their own digital stories focused on a person / event / text / object from the Hellenistic World. One of the videos is below - go to our Youtube channel for the rest! Dr Michael Scott has been awarded an IATL grant for his project 'Approaching the study of Greek religion'. This will run as part of the 2nd and 3rd year module on Greek Religion in 2014-5. The grant will allow for students to lead discussion seminars with invited academics, learn about different formats for communicating knowledge (leading to them writing short TV documentary scripts and films), and, in conjunction with the Student as Researcher project based in Warwick Library, deliver their own research as part of a module-wide group database project on Greek sanctuaries. With funding from an IATL pedagogical intervention grant Dr Zahra Newby organised a Practical Mosaic workshop for students taking the module 'Domestic Space in the Roman World'. The workshop was held for 3 hours on Wednesday 26th February and was run by Lawrence Payne of Roman Mosaic Workshops. Before the workshop Lawrence put up a page on his website explaining to students what they should expect from the workshop. The workshop itself ran for 3 hours; Lawrence gave an introductory lecture on what is known about the techniques of Roman mosaic working, before allowing students to choose one of two designs to create themselves: a bird or a 2-strand guilloche. Although we used modern pva glue rather than mortar, the processes of laying out and positioning the tesserae followed Roman techniques. The aim of the workshop was to allow students to experience for themselves the processes involved in creating complex mosaics, including issues such as the time involved, the practicalities of team working to create larger mosaics, and the possibility for errors to arise. A 35 minute video from the session is available on our Youtube channel! Thanks to an IATL pedagogic intervention, the Greek Culture and Society module now features a seminar where students drink from replica Greek vases (with Ribena rather than wine, of course!) The seminar encourages students to think about the Greek symposium setting, how Greek vases would have been used in practice, and to demonstrate how difficult drinking from these vases actually is (its a true test of Greek citizenship!) Via this interactive mode of learning, students are also able to see how images on these vases were viewed in practice. With an IATL pedagogic intervention, students on the City of Rome module went to Rome for a three-day trip with Dr Abigail Graham, where they were able to see how the monuments of Rome interacted with each other and with the urban landscape first hand. Students were given access to sites and monuments not normally open to the public, and stayed at the British School at Rome. Funded by an IATL academic fellowship, the Democracy and Imperialism module run by Dr. Michael Scott involved an online forum, a trip to the British museum with Q and A with the curators, a series of guest lecturers from other universities, and a live debate via the Warwick International Portal with undergraduate students from Monash University in Australia. With an academic fellowship in 2012, Dr. Fabienne Marchand created a list of resources and a sources booklet for students in the Hellenistic World module. Students were given a guest lecture in papyrology, and encouraged to engage directly with primary materials. A trip to the British Museum to see the blockbuster exhibition 'Life and Death in Pompeii and Herculaneum' and a poster competition was sponsored by the Institute of Advanced Teaching and Learning. This complemented their work for the first-year core module Roman Culture and Society. The students learnt how to work together to produce a research poster on an object of their choice, which they had studied at the exhbition. They received training in how to design their poster, and the best two posters received prizes. A range of artefacts inspired the students, including the statue of Eumachia, garden painting, carbonised bread loaves, sea-life mosaic. The two winning posters focused upon carbonised bread and the painting of Bacchus on Vesuvius.